Size : 25.6 x 28.0 mm. Weight : 8.05 grams. Obverse : Three quarter figure if Christ standing forward, with IC XC to the sides, and a Greek inscription around. Reverse : Jewelled cross with IC XC NI KA between the arms. 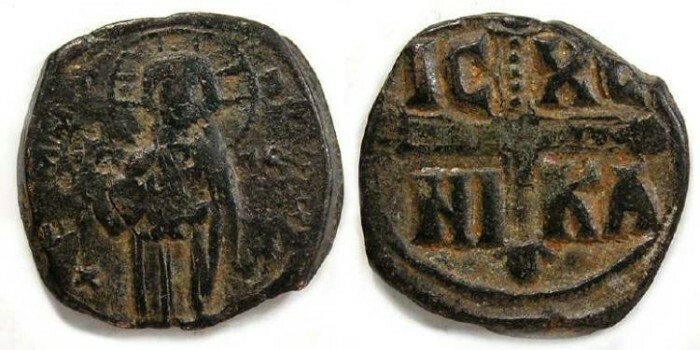 This example is dated to the time of Basil II rather than Constantine VIII because of the much heavier weight standard. 13.32 grams is just slightly light for Basil II, but the Constantine VIII are usually under 10 grams.